BC [ heavy ] Biermann is an educational technologist, digital artist, and painfully average surfer 😉 With a PhD in Humanities [ Intermedia Analysis ] from the Universiteit van Amsterdam, his academic work investigates the intersection of emerging technologies and semiotics in ways that address impending social, political, and ethical impacts. 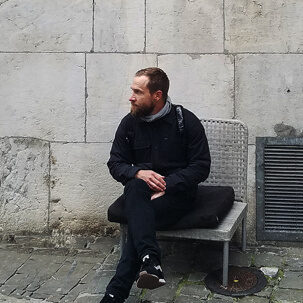 As a digital artist, BC is a pioneer in interactive augmented reality design and his work has been exhibited in such cities as Austin, New York, Miami, St. Louis, San Diego, Perth, and Geneva. A thought leader and futurist in the mixed reality space, BC serves on the IEEE Mixed Reality and Artificial Intelligence Group as a Part of The Global Initiative for Ethical Considerations in the Design of Autonomous Systems. At his spinning core, BC is really just a sci-fi nerd who loves hanging out on the beach all day with his family + peeps.